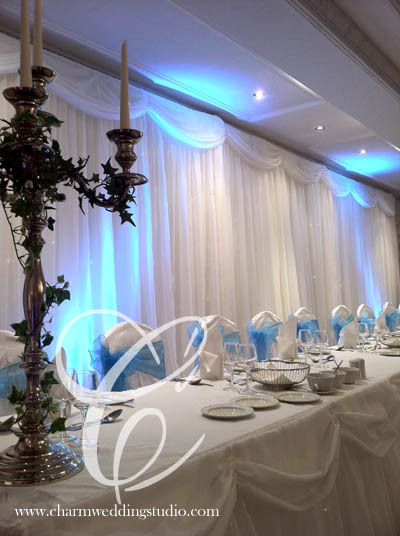 We provide luxurious and professional Fibre Optic (no wires visible) and LED Backdrops, designed to transform any room! 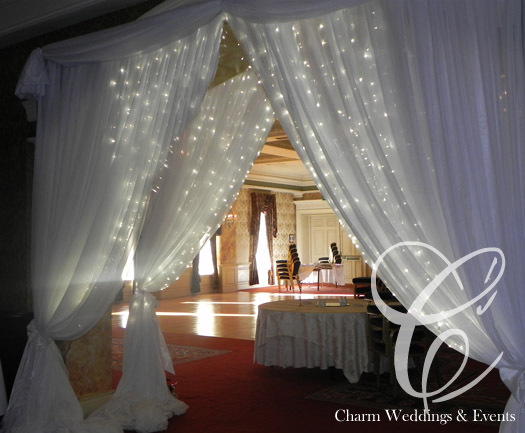 We also provide room draping, room dividers, entrance draping, pillar draping and more to suit your venue. 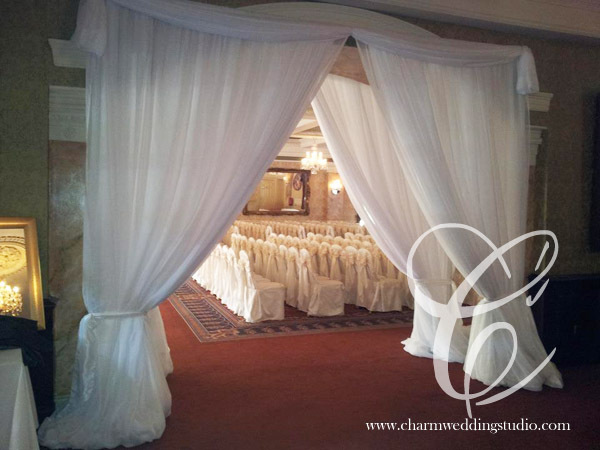 Draping available in a range of colours and styles to suit your theme. 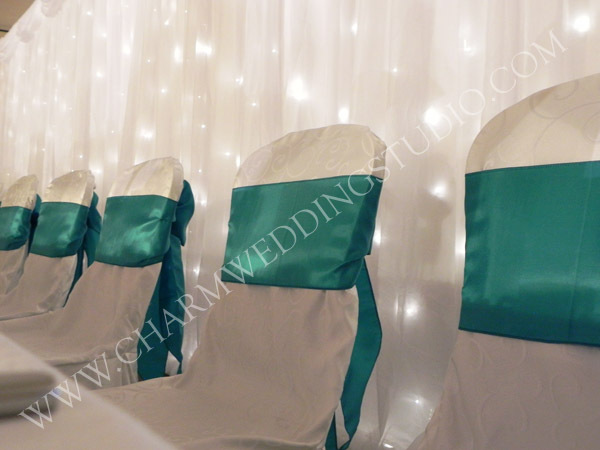 Our professional fibre optic backdrop system is available in white or ivory and can cover up to 30ft wide and 10ft high. We can adjust it so it fits perfectly in your room. 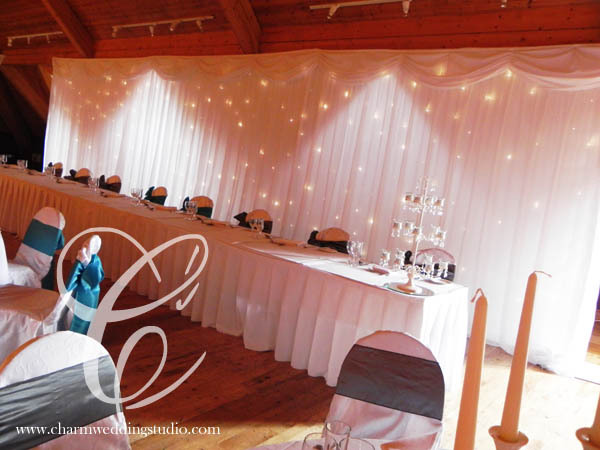 There are no wires visible at all in these fairylight backdrops as all the lights are built into the fabric. For those that want a brighter backdrop we have LED backdrops available with beautiful white draping. Luxury black drapes are also available and we also have uplighters available in any colour to add that finishing touch to your room. We hire and install pipe and draping systems to transform any space and cover walls to make a room totally your own. 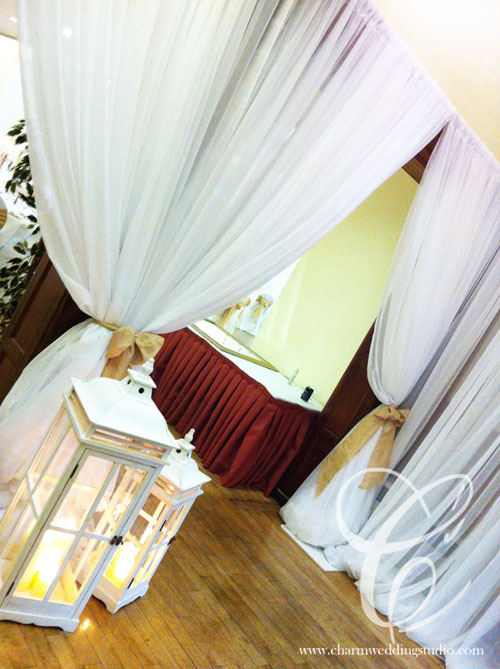 We can also set up window draping where you don't want to lose a view but would like to add a special touch to a room. 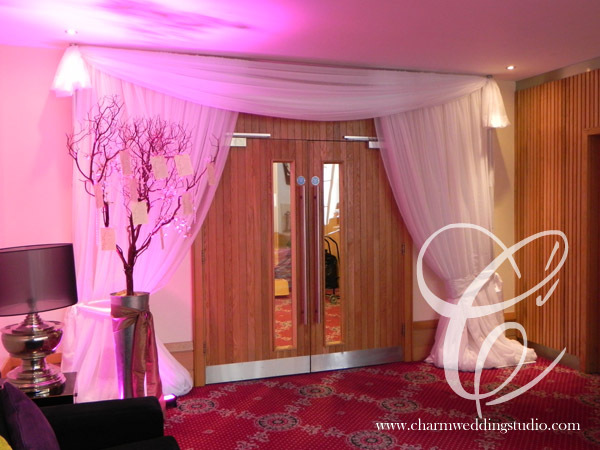 Entrance draping and pillar draping also available with optional fairylights. 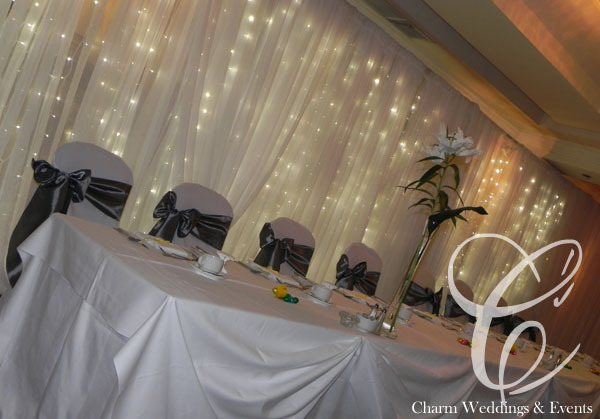 Prices depend on room size, email info@charmweddingstudio.com with your date and venue for a competitive quote. For wedding packages prices click here » or get in touch for individual product prices or tailored packages. 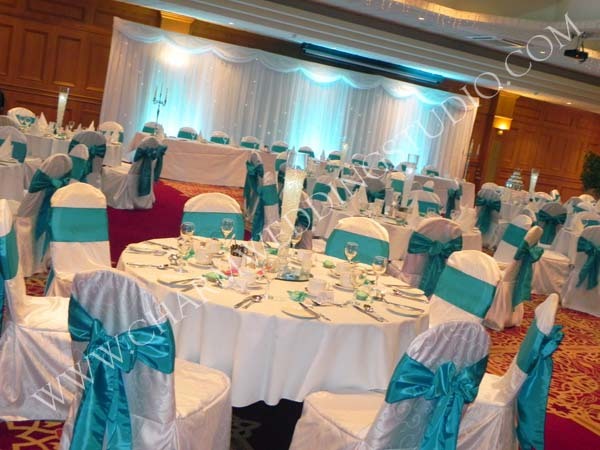 Balmoral Hotel, Beechlawn Hotel, Belfast Castle, Burrendale Hotel, Clarion Hotel Carrickfergus, Clandeboye Hotel, Clandeboye Estate, Culloden, Dunadry Hotel, Edenmore Golf Club, Europa Hotel, Galgorm Resort Ballymena, Hilton Templepatrick, Larchfield Estate, La Mon Hotel, Malone House, Marine Court Bangor, The Old Inn Crawfordsburn, Park Avenue hotel, Ramada Encore, Ramada Shaws Bridge Belfast, Rosspark Hotel, Shandon Golf Club, Slieve Donard, Stormont Hotel, Templeton Hotel, Ten Square Hotel, Tullyglass House Hotel...and many more. 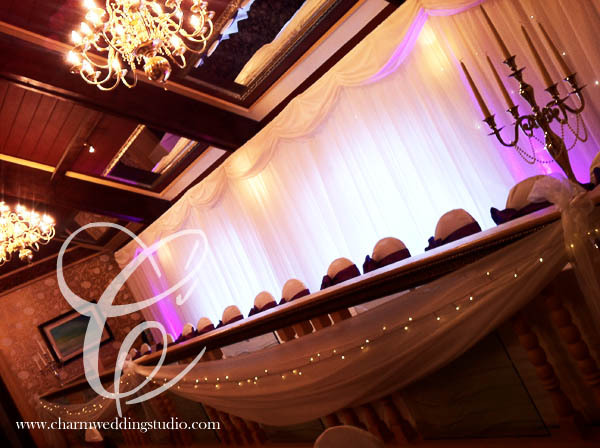 Just email us at info@charmweddingstudio.com for a quote or to arrange an appointment to come and have a chat with us and see our product range. You can also phone using the contact details on the contact page.